Montessori Education” was founded in 1907 by Dr. Maria Montessori. She based her educational methods on the scientific observation of children’s actual learning processes, and then shaped her academic program around the fact that children have the innate ability to teach themselves. The result is a model that aims for the fullest possible development of the whole child, ultimately preparing him or her for life’s many rich experiences. The practical application of the Montessori method is founded on basic human tendencies – the need to explore, move, share with a group, to be independent and make decisions, create order, develop self-control, use one’s creative imagination, work hard, concentrate and perfect one’s efforts. The Montessori method embraces these tendencies and incorporates them into daily classroom activities. …is to provide students with a carefully planned, stimulating “prepared classroom environment” that is based on brain-based developmental needs with the goal of helping each child build an excellent foundation for both current and future learning. To see for yourself what the Montessori model looks like in action, please feel free to send a request for a tour of any one of our public Montessori schools by contacting them directly. In 1896, Dr. Montessori was appointed as the head of an institution in Italy that was devoted exclusively to the care and education of mentally handicapped children. After working with these children by utilizing the techniques she developed from her previous brain-based research, she asked several of the eight-year-olds under her care to take the prescribed state exams. Surprisingly, the children not only passed these exams, but they did so with above average scores. 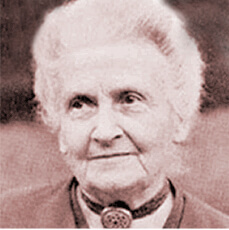 This success prompted Dr. Montessori to look into the effects that her teaching philosophies might have on children outside of the institution. In 1907 Maria Montessori founded her first Casa dei Bambini, or “Children’s House,” for disadvantaged children living in the city’s slum districts. At the school she focused on teaching students various ways to develop real-life skills and to expose them to relevant educational concepts, all at a pace that each child could set for him or herself. She also identified several critical periods of early childhood development through her observations, and then shaped her teaching methodology around these in order to address a child’s “sensitive periods of learning” with age-appropriate materials and activities. From that time, right up until her death in 1952, Maria Montessori continued her educational work, and her methods eventually became widely recognized and embraced throughout the United States, Europe, and India. She also founded and established a research institute in Spain, and developed Montessori Training Centers around the world. Today there are over 7,000 schools in nations across the globe that use this highly effective method of instruction in their classrooms. Q: Is Montessori just for preschoolers? A: Many Montessori schools tend to focus on just Preschool or Lower Elementary programs because the ages from birth to six years old are recognized as the most sensitive and influential periods in a child’s learning and development cycle. However, successful Montessori programs have been developed and are used around the world for students from Preschool all the way through High School. Q: What is the difference between traditional schools and Montessori schools? A: Please view our comparison table to read 15 reasons why Montessori schools are different from traditional public schools. Q: Are Montessori schools as academically rigorous as traditional schools? A: Yes. Montessori classrooms encourage students to go beyond the basics of rote memorization or learning facts to pass state-mandated exams. Montessori learning embraces the in-depth exploration of interconnected concepts across the curriculum, and helps students to develop skills that lead to higher-level thinking and a complete and well-rounded understanding and internalization of lessons being taught. Q: Are Montessori lessons fun? A: Of course! Lessons are presented in a unique and exciting way so as to inspire curiosity. Once presentations are given, students are empowered to choose from materials that interest them most. They are encouraged to be self-directed, and are given the opportunity to participate in picking the types of lessons they will complete throughout the day. Children become an active partner in their education, being able to control the mastery of their own personal academic skills. Q: Why do Montessori classrooms look different from traditional classrooms? A: The arrangement of a Montessori classroom is based on the method’s distinctive educational practices and materials. Rather than making the teacher at the focal point of the class, a Montessori classroom has a child-centered approach. Children work at tables or on floor mats where they can spread out their work, and the teacher circulates about the room, giving both group and individualized lessons and providing assistance to students as needed. Q: If Montessori children are free to do whatever they want in the classroom, how does the teacher ensure that each student is receiving a well-rounded education? A: Montessori children are given an integral say in the development of their own individualized lesson plans, and are then given the freedom to choose within these options. The classroom teacher and assistant ensure that children are only allowed as much freedom as they can responsibly handle, and that children do not interfere with each other’s learning. They monitor each child’s progress to ensure that each child is progressing at their own appropriate pace in all subjects. Q: Is it true that Montessori schools have no textbooks or homework? A: Montessori education is primarily experiential and hands-on learning, especially at the lower grade levels. This means that children work with specially designed materials in the classroom before moving on to pencil-and-paper methods. As students grow and move through the upper elementary and middle school years, written resources begin to make more appearances. Students at this level are encouraged to engage in research rather than to just rely on textbook descriptions. Middle school students may also be assigned homework such as math problems, writing and reading assignments, and research papers, but Montessori educators are careful to try not to over-schedule a child’s afterschool time, giving students ample opportunity for afterschool activities and relaxation. Q: Are Montessori schools religious? A: No. Students are educated without reference to religious denominations or teachings. As a result, Montessori classrooms are extremely diverse, with student students who come from numerous different cultures, backgrounds and religions. Q: Since Montessori classrooms traditionally emphasize non-competitiveness, how are students adequately prepared for real-life competition? A: Montessori classrooms emphasize innate learning, where a student self-monitors, self-corrects and uses a variety of other higher-thinking and reasoning skills aimed at their own continuous self-improvement. Students typically become comfortable with their strengths and learn how to properly address their weaknesses. In upper grades, students often participate in group activities such as debate or theater, in which they are encouraged to give not only their best performances, but to simultaneously encourage their peers to do the same. Q: How do Montessori graduates fare in the “real world” when they have to follow a structured agenda? A: Increasingly, the modern world favors creative thinkers who can combine personal initiative with strong collaborative skills. These traits are exactly the types of characteristics that a Montessori education nurtures. Adults who previously attended Montessori schools have spoken positively of their childhood experiences using the Montessori method, saying it gave them not only the ability to work cooperatively, but also the confidence, creativity, and communication skills needed to make innovative and ground-breaking changes in their work or home environment. A: Maria Montessori called her first school in Rome the “Casa dei Bambini”, or the “Children’s House.” Everything was designed for the world of a 3-6 year old, down to child-size furniture and learning materials. To this day, Montessori pre-primary classrooms around the world are referred to as Children’s House classrooms. Dr. Maria Montessori found that children have a tremendous ability to learn from the world around them. Based on this observation, Dr. Montessori felt that every classroom should be a “prepared environment” that contains appropriate learning materials for students. The proper use of these materials is to be demonstrated in both individual and group settings, and then these should be made available for children to work with at his/her own pace during large periods of uninterrupted time. Montessori required teachers to carefully observe and record the student’s choices, and then to regularly review those findings in order to properly guide and challenge their students. She found students flourished under this type of experiential learning, and exhibited higher levels of concentration, motivation and self-discipline. Modern-day Montessori teachers are trained using Maria’s observational methods to be facilitators in the classroom, always ready to assist and direct. They stimulate their students’ enthusiasm for learning and guide them, all without interfering in each child’s natural desire to become independent. Children work through their own individual cycles of activities, and learn to truly understand what they are learning according to their unique needs and capabilities. Freedom for self-directed learning – The Montessori method allows children to choose their own activities, allowing them to experience self-directed learning. Work Centers – Classrooms are arranged according to subject areas, with children free to move around the room instead of staying at desks. There is no set time limit that a child has to work with a piece of material. At any given moment all subjects may be being studied in the classroom, including math, language, science, history, geography, art, music, etc. Observation and indirect teaching – Montessori teachers are taught to observe each child engaging in activities and to discern the child’s natural instincts. The teacher can then use both the student’s strengths and weaknesses to provide lessons and materials that will broaden their learning experience. Academy teachers work hard to maintain a balance of both following each child’s readiness and ability, while still fulfilling the state’s curriculum guidelines. Multi-age groupings – Children in two to three-year age groupings learn from each other in a way that supports both independence and self-directed activities. Classroom instruction promotes peer-to-peer interaction, problem solving and positive socialization. Research shows that Montessori children are well-prepared for life academically, socially, and emotionally. In addition to scoring well on standardized tests, Montessori children are often ranked above average on skills such as following directions, showing responsibility, asking provocative questions, exhibiting enthusiasm for learning, and adapting to new situations. Extrinsic rewards reduce motivation and the level of performance does not remain high once the rewards are removed. We learn best when our learning is situated within meaningful contexts. Children can learn very well from and with their peers. Each of these elements can be found every day in a child’s Montessori classroom, and all are essential to Montessori education.